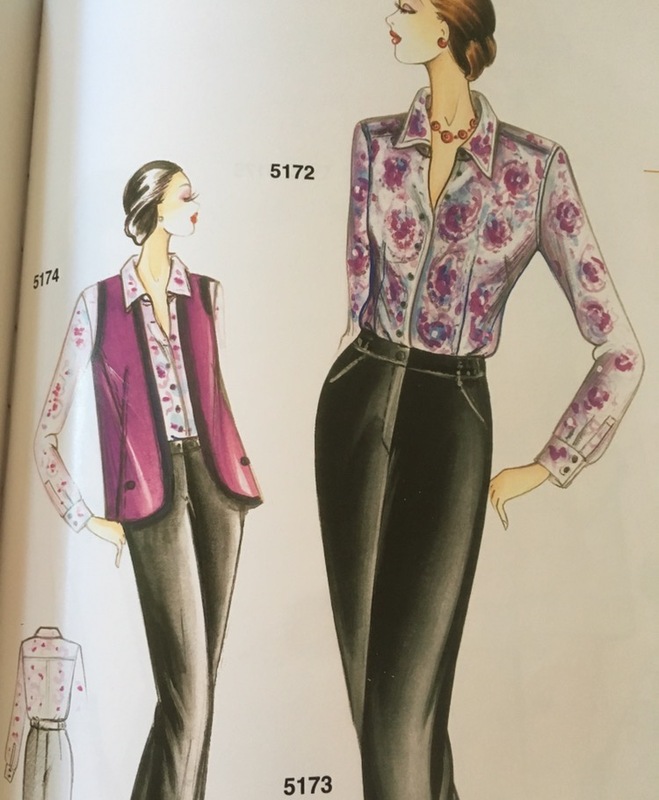 I’ll admit I was hoping Marfy 5172 (from this year’s Evergreen catalogue) was going to be my go-to button up shirt pattern, what – with my favourite RTW shirt maker Rhodes & Beckett going into administration and all. I’ve been living in their shirts all my working life, and them going out of business and me sewing a bazillion shirts and blouses is no coincidence. 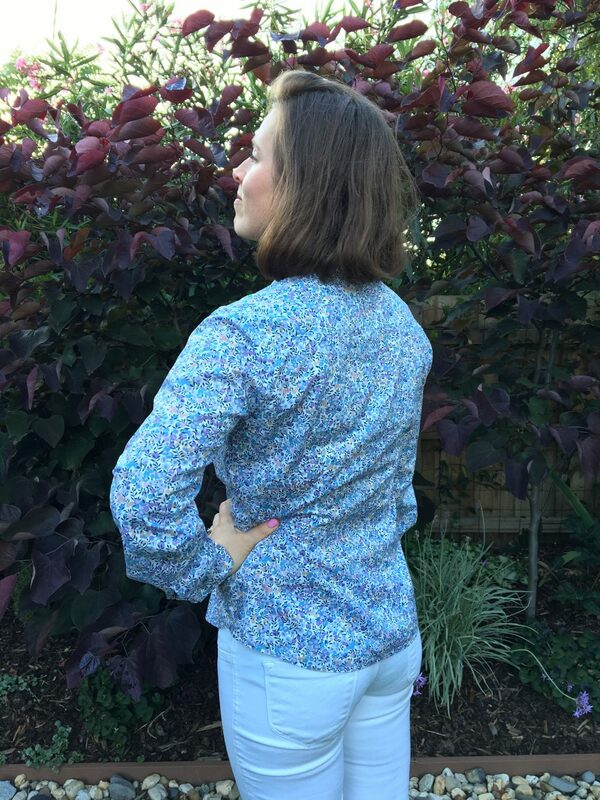 It’s a similar style to my favoured RTW shirts – with a back yoke, front darts for shaping, stand up collar, and long sleeves. 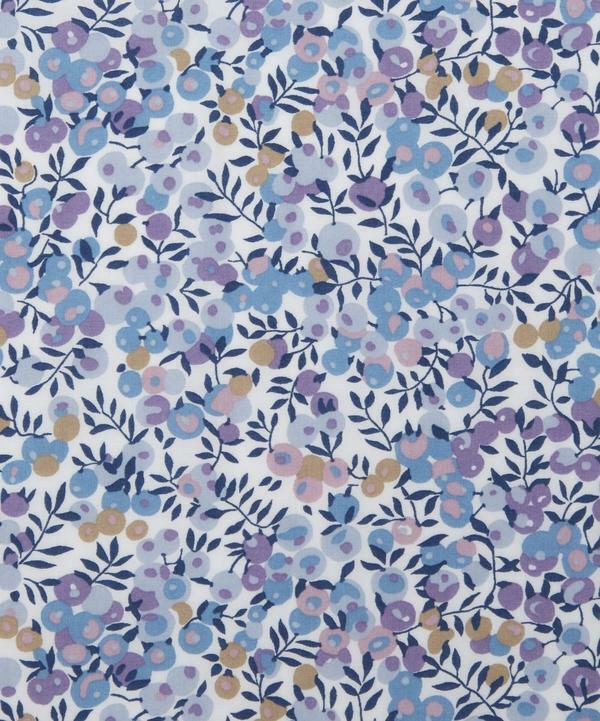 Another Liberty, this time the classic Wiltshire print in a lilac and blue colourway, which I absolutely adore. The tana lawn is lovely and light compared to the Egyptian shirting cottons I usually wear – making it perfect for the impending summer. I wanted to get the crisp collar thing going on – so I took the plunge with some interfacing from Fashion Sewing Supply. 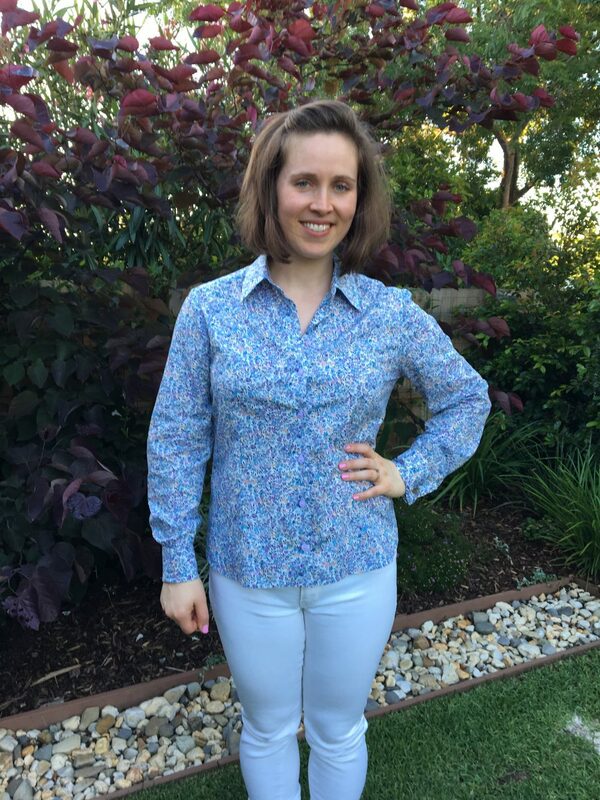 I bought two types – for this shirt I’ve used the Pro-woven shirt-crisp fusible interfacing. They don’t post internationally anymore, which from my uninformed position seems like a silly business decision. I’m stubborn so I used a mail forwarding service. It’s been a couple of months since I finished this one, so it’s had plenty of time to show me how it wears. The fusible itself has laundered well so far (it’s been through the washing machine numerous times now), with no bubbling. It’s also worn well along the French Cuff fold. I followed the instructions of pressing for 20 seconds on high heat with no steam (I used a pressing cloth). However, I’m not happy with the strength of the interfacing. My personal preference is for my collars to be significantly more stiff – and this is just using it on a very lightweight tana lawn. Within 30 minutes of wearing, the collar points have caved in and curled upwards. Had I used this on any of the heavier oxford-weave cottons I have in my stash – I’d want something heaftier still. 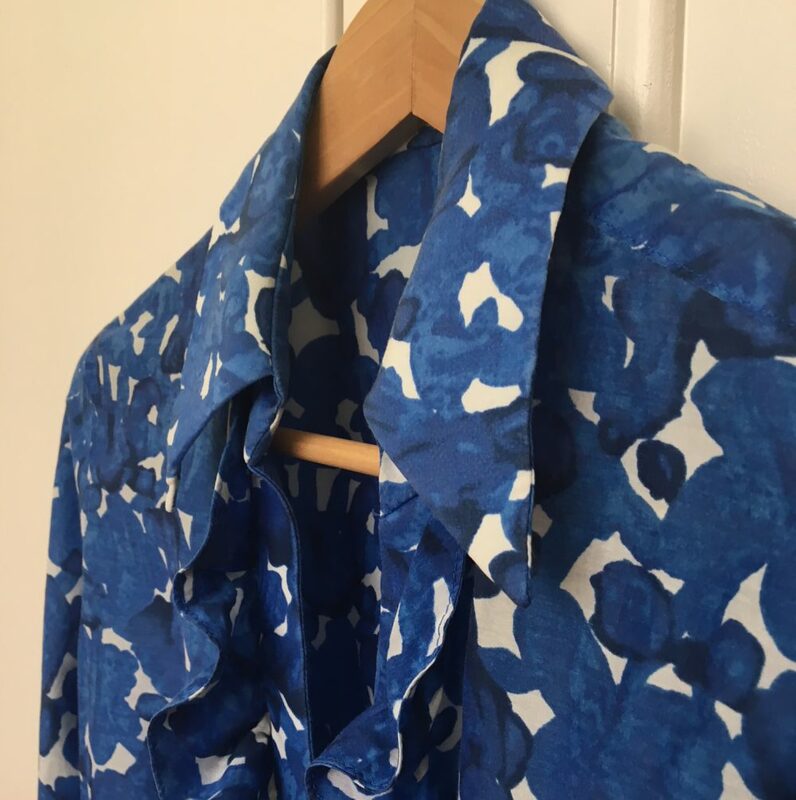 Compared to my Blue Blotch Blouse, which in weight is very similar if not slightly on the lighter side – and which I used organza to support the collar with – I’ve been incredibly happy with how the collar has behaved. Always bouyant, always well-shaped, even post-wash and pre-iron. I traced out the pattern pieces, and cut on the inside of the tracing so that the fusible piece would be slightly smaller than the pattern piece. Then pressed in place (instructions recommend a dry setting on your iron, and to hold for 20 seconds. I used a pressing cloth as well. Next time I’ll cut a smidge more away from the interfacing so I can get a nice turn of cloth when turning the pieces back around. The collar is beautifully drafted – with the undercollar accounting for turn of cloth and being slightly smaller in width than the upper collar. I interfaced the upper collar and inner collar stand only, leaving the other two pieces as is. 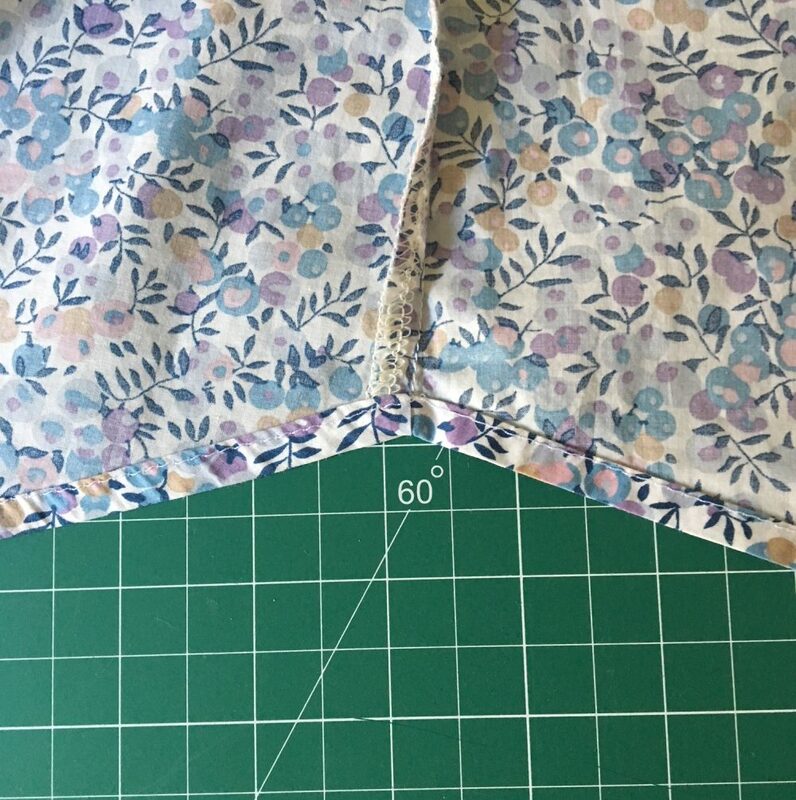 I also did tack together the seam allowances between the collar and collar stand so that it would be held in place – encouranging the collar to fold over into position. 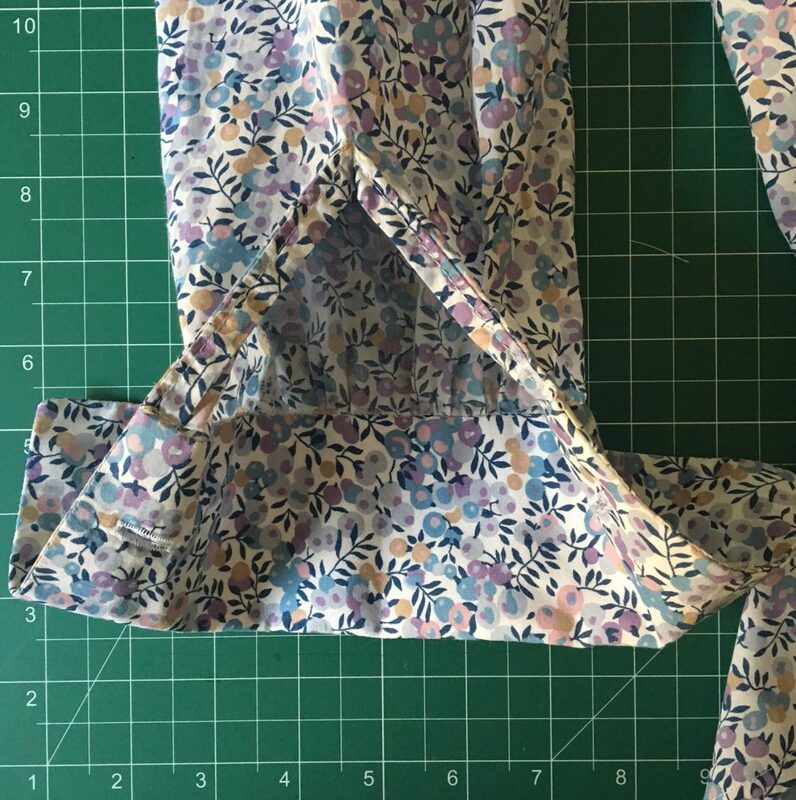 The interfacing actually made construction of the collar much easier than the one I did on my toile (or any other collar stand I’ve sewn before, actually) – especially around the collar stand curve at the front. I’ve clipped it very closely of course, but it basically held the lovely curve before pressing it into submission. I’m really happy with the outcome here! I’m particularly taken with the lilac-y-pink buttons, which surprisingly to me, are from Spotlight. I made this up in the size 46. 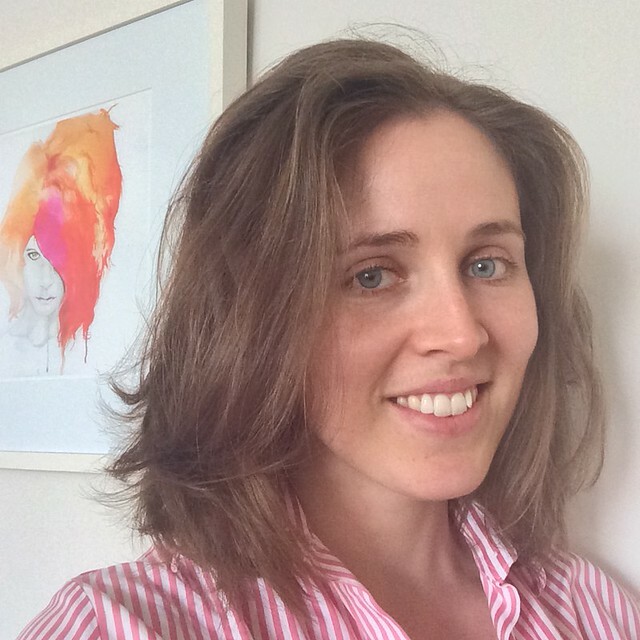 The shoulders and bust fit really well and comfortably – lovely shaping through the front, but with the ‘blouson effect’ happening at the back. I ended up adding in two small diamond darts at the back, which I copied from my favourite F3449 blouse. I typically wear my cotton work shirts with jeans/work-issued-pants when I’m in the field which means I wear them untucked, so having that shaping at the back is just what I prefer. Because of this, I also changed the hem from being straight to curved. I took the template for this adjustment from my Blue Blotch Blouse (a now OOP McCalls) and softened the curves at the side seam a bit. The sleeve cuff ends in a pleat and some gathering, plus a split where the cuff’s end, fastened with a button. The pattern has a standard issue cuff on it (button up) – but I far prefer a French Cuff, so I mocked up my own pattern piece for this. Next time, I’ll improve this by shaping it more like a trapezium than a rectangle, or move the buttonholes closest to the sleeve closer in, so that when folded over, the insides are hidden somewhat. Same as the principle of ‘turn of cloth’. 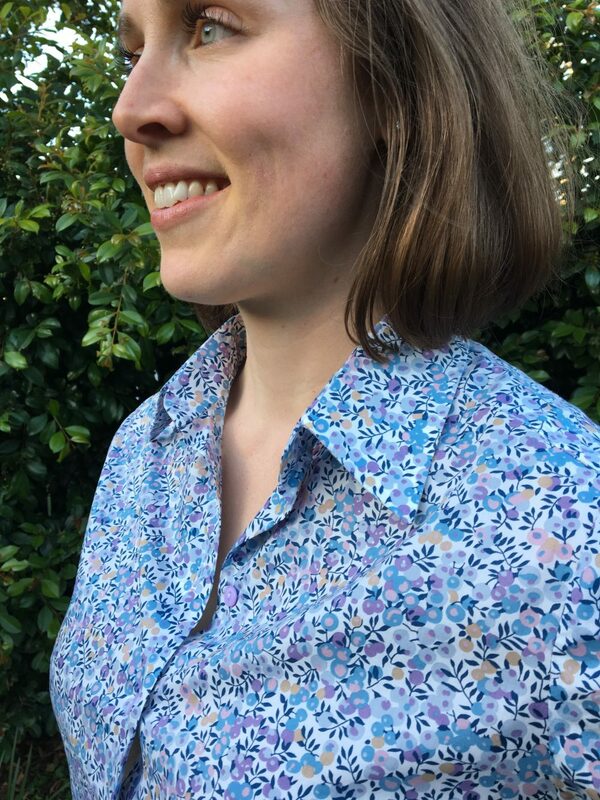 I reach for this shirt a lot – it’s a great work basic and I just love the colours in this particular Wiltshire print. In future I plan to add an extra inch or so to the length, and work on my shaping efforts, which I believe have room for improvement (especially at the back). F5172 is definitely going to become my standard issue cotton work shirt pattern, and considering the number of shirting cottons in my stash, you can expect to see more of it in future! I do love that print, and will have to take a look at this Marfy pattern. It looks fabulous on you! What a lovely shirt. I agree that there is no fabric as suitable to hot humid summer days than Tana lawn, and Libery’s prints are so pretty! Interesting points on the interfacing of the collars; I’ve noticed that organza never fails in holding its shape and body, either, even if it’s a bit softer in feel. And your French cuffs are divine! I love me a set of French cuffs. Thank you :) I hadn’t appreciated just how well the organza worked in the other shirt until I’d worn and washed this one a few times! It just doesn’t stop doing its job (in shape before I even iron it), and can often be made of scraps = win. Future tana lawn shirts will definitely be organza interfaced. very pretty shirt. 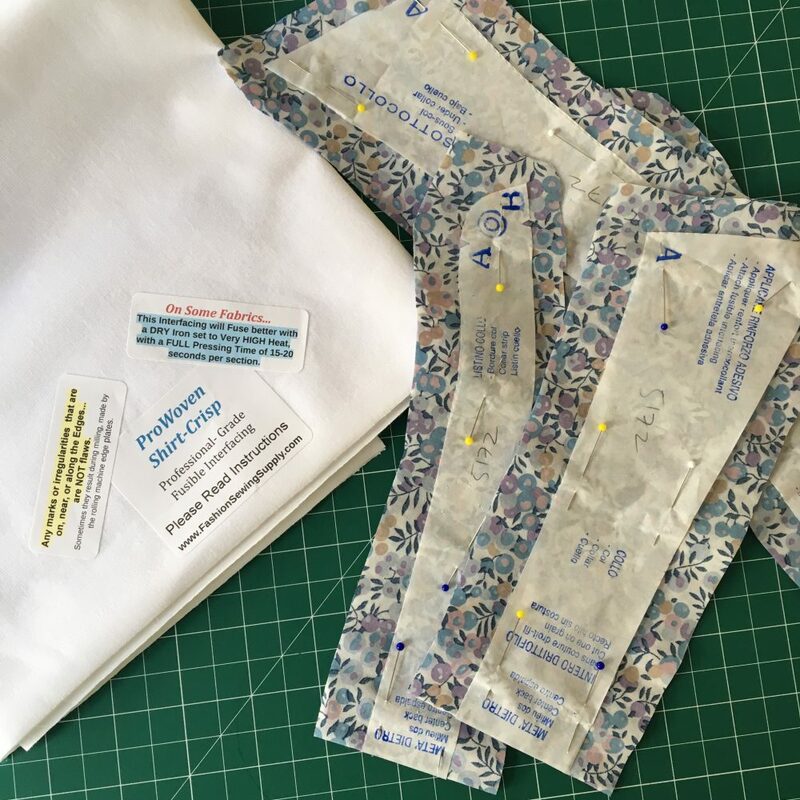 As for the interfacing, I use the Fashion Sewing Supply interfacings for everything – they are 90% great but I didn’t like the shirt crisp ones at all, didn’t fuse as well as I would like and just felt odd. I have better luck with 2 layers of sheer elegance in collar and cuffs. Or I put one of the fusible and one silk organza…. Beautiful workmanship. I appreciate your observation on silk organza for interfacing, and that of Beth at SunnyGal Studio. It sounds like it is the ideal interfacing. It really is, and so underestimated! i’ll be going back to it in future, for sure :) Thanks, Carol! Looks like a job well done! I find shirt sewing difficult, so if I wore them all the time, I would have cried if my favourite shirt maker went out of business. Instead, you have knuckled down and made your own! Lovely print and the lighter weight sounds perfect for hot Australian summers. Fashion Sewing Supply is also my favorite for interfacing. I just took advantage of their annual sale and noticed that they will start shipping internationally in 2018. I used the woven shirt crisp to replace collars and cuffs on my husband’s shirts and found two layers worked better than one. I agree with you that one layer just isn’t stiff enough. I also found that trimming the interfacing about 1/8 inch from stitching line left room for turn of the cloth and produced great results. I edge stitched for added insurance that the interfacing would stay in place with repeated washing. I’ll also try the silk organza option; maybe with satin-faced organza which is a little stiffer. 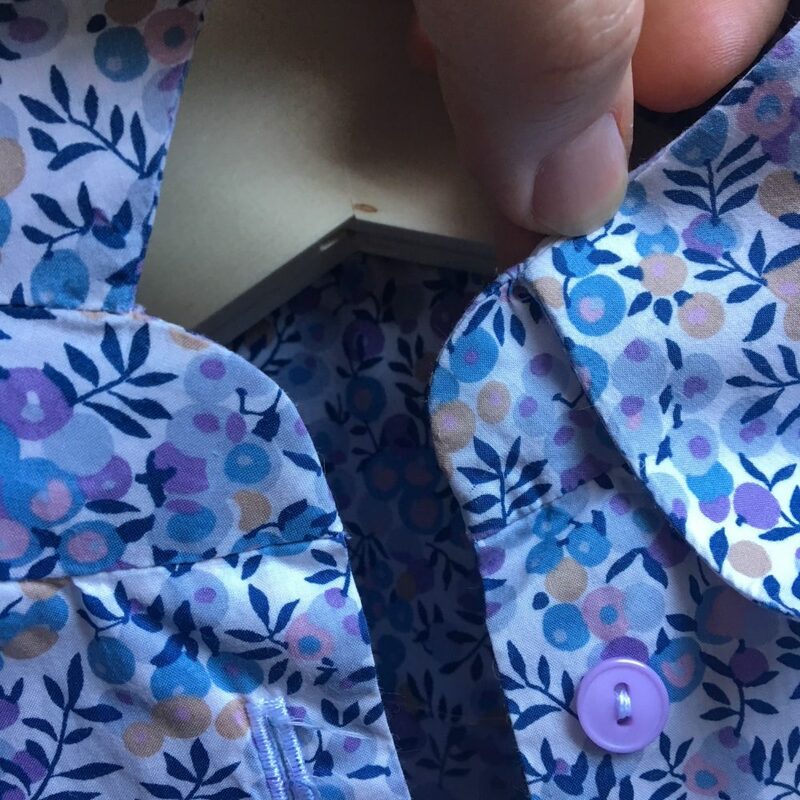 The lilac buttons are perfect and the fit looks great. Lovely shirts! What a bummer about R&B going out of business. I bought their suits and there really isn’t anything else available of the same quality and price. But of course I have a lot of suiting fabrics in the stash. Perhaps it is time I had a go myself! Nice job on the shirt, Mel. I see that maryfunt says that Fashion Sewing Supply are going to ship internationally in 2018, which is excellent new, but I was also very impressed by your resourcefulness on the mail forwarding. I’m also searching, thus far fruitlessly, for the perfect shirt collar interfacing, and would be more than happy to go halves on any future test imports you arrange, if it would help. My view is that you can never have too many different types of interfacing! 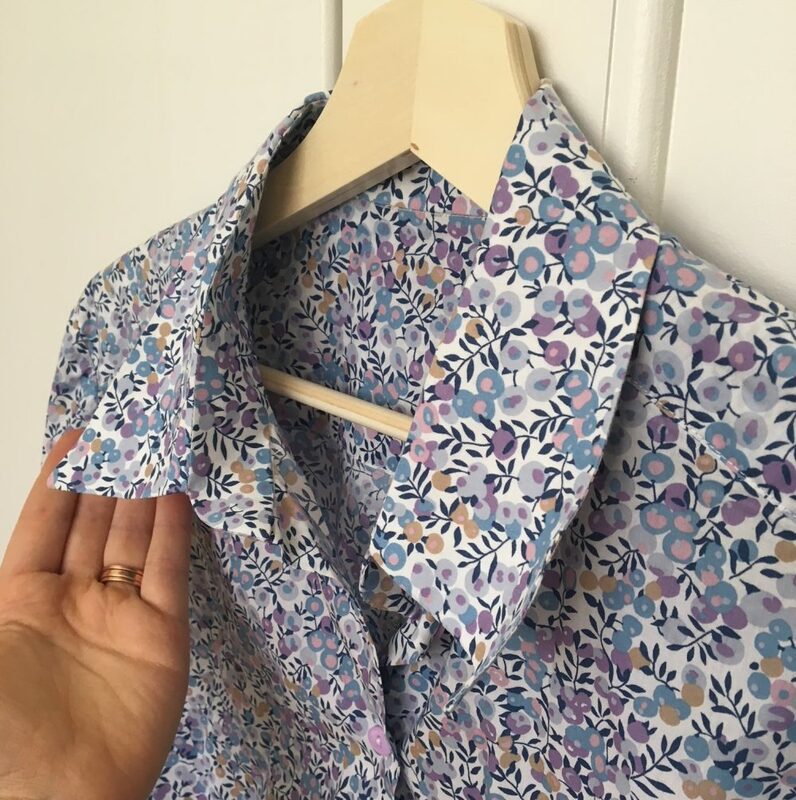 Some lovely details on this shirt, I’m on a bit of a shirtmaking kick at the moment and have been thinking about interfacing. I got some very nice lightweight woven stuff from lincraft of all places – like fusible voile – it was in black only at my store though.